William “Willy” Theodore Ribbs, Jr. is the first African American to test-drive a Formula One car, the first African American to compete in the Indianapolis 500 in Indiana, and one of only a few African American NASCAR racers. Born January 3, 1955, in San Jose, California, he is the one of five children of William (Bunny) Theodore Ribbs Sr., a plumber and amateur road racer, and Geraldine (Henderson) Ribbs. William Ribbs’s love of cars and racing began at the age of four. After graduating from San Jose City College in 1975, Ribbs headed to Europe to compete in the Formula Ford series. He outperformed most of that country’s promising young drivers, placing first in six of eleven races, winning the championship and earning the titles “Star of Tomorrow,” and “ International Driver of the Year” in a series sponsored by Dunlop Tire in 1977. In 1978 Ribbs returned to the United States and made his American debut at the Long Beach Grand Prix where he finished tenth. Ribbs won the pole in the Long Beach (California) Formula Atlantic Race in 1982, outpacing veteran drivers before his engine failed. He won five races in the Kansas-based Sports Car Club of America (SCCA) Trans-Am in 1983 and was honored as Pro Rookie of the Year. After competing in two NASCAR Winston Cup races in 1986, financial difficulties, including the lack of corporate sponsorship, kept his team from finishing the season. Bill and Camille Cosby stepped in during the 1989 season and funded the Raynor-Cosby Motorsports team with Ribbs as the star driver. Ribbs won two top-ten events in his 1990 Championship Auto Racing Team (CART) Indianapolis debut. 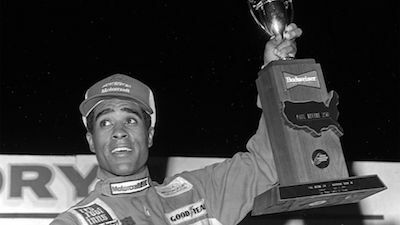 In 1991 he became the first African American to qualify for the Indianapolis 500, driving his Buick-powered 1990 Lola ten miles around the two-and-one-half-mile oval at an average speed of 217.358 mph, making him the fastest qualifier of the day and earning the Walker Motorsports team a much needed $20,000. Ribbs qualified again in 1993. However, by 1994 it was clear that corporate sponsors were not yet willing to back an African American motorsports athlete, despite Cosby’s offer of free television commercials in return for sponsorship. Ribbs was released from his Indianapolis 500 contract and spent the year competing in the CART series, finishing in the top ten at the Michigan and Denver (Colorado) Grand Prix races. In 1999 Ribbs raced in the Las Vegas (Nevada) Indy Racing League (IRL), and in 2000 he signed with Victoria Motorsports SCCA Trans-Am team; finished second at Long Beach, third at Detroit, and fourth at Las Vegas where he was awarded the Johnson Triple Crown. In 2001 Ribbs joined the NASCAR Craftsman Truck Series with the support of the Dodge Corporation, which initiated a motorsports diversity program to provide opportunities for minorities to race. This made Ribbs the first African American in the modern era to compete full time in a major NASCAR division. Although Ribbs retired from professional racing in 2000, he reemerged in 2001 as a NASCAR World Truck Series driver. In 2011 he formed the Willie T. Ribbs Racing Company, featuring African American driver Chase Austin. Ribbs married Suzanne Hamilton in 1979, and together they had two children, Sasha and William Theodore Ribbs, III. David K. Wiggins, “African Americans in Sports: The Hard ride of Willy T,” New York Times Magazine, October 9, 1988; D. L. Chandler, “Little known black history fact; Willy T. Ribbs,” May 19, 2014 (http://blackamericaweb.com/2014/05/19/little-known-black-history-fact-willy-t-ribbs/2/); “Sportsmakers: Willy T. Ribbs,” The History Makers, The Nation's Largest African-American Video Oral History Collection” April 1, 2002, (http://www.thehistorymakers.com/biography/willy-t-ribbs-39).